Cap Touch click is a capacitive touch sensing button, integrated on a click board™. It can be activated by touch. This click can sense touch even through plastic, wood, or other dielectric materials, which can be used to protect the surface of the PCB and the sensor pad trace itself. Unlike the mechanical button, the capacitive touch button lasts much longer, it is not prone to damage and wear over time and it is very reliable. Capacitive buttons are a very popular method of powering up various devices. Besides the aforementioned benefits, having a touch sensitive button on a device allows for a compact design, opens possibilities for various kinds of human-machine interface and - it looks good and modern, especially if accompanied by a LED that turns on when activated, just like the one on Cap Touch click. Cap Touch click can find its place among many applications - for touch activated lighting controls, touch activated control panels, toys and any other applications that need a switch or a button. 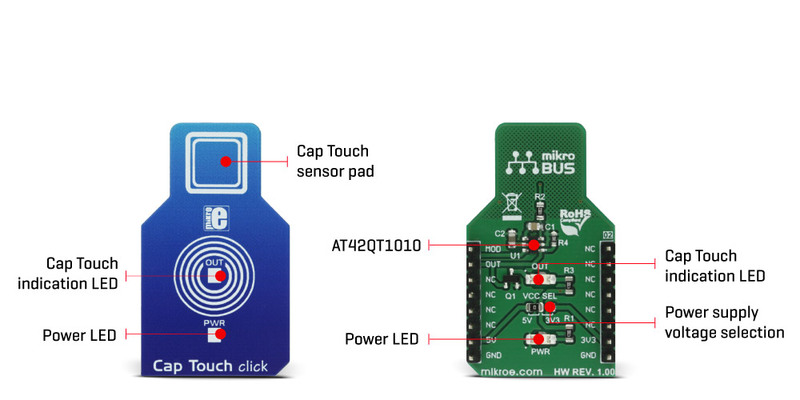 Although it looks simple at first glance, capacitive touch sensing is not an easy task. There are many parameters that need to be sampled, filtered, compared and processed before positive touch detection is confirmed. To make this possible, Cap Touch click utilizes the AT42QT1010, a single-key QTouch® touch sensor IC from Microchip. This IC has some advanced features such as the self-calibration, auto drift compensation, noise filtering and proprietary QTouch® technology, based on the patented charge-transfer method. These features enable Cap Touch click exhibit very reliable and accurate touch detection. Capacitive touch sensing is based on detecting a change in capacitance, due to the influence of a foreign object. Basically, the capacitance of the sensor, also known as the antenna, is measured and monitored and if a significant change occurs, after processing by the detection integrator, a touch event is acknowledged. To successfully perform the detection, many routing requirements need to be met, as the relation between the sensing elements in position and size is crucial. Cap Touch click is designed with these requirements in mind, so it could successfully detect a touch. - Fast mode yields the fastest detection time, yet it uses the most power, as the device continuously sends measuring bursts, with about 1ms of delay between them. The device will work in this mode if the PWM pin stays permanently at HIGH logic level. - Low Power mode will send measurement bursts with about 80mS delay in between, significantly lowering the power consumption, as well as the responsiveness of the device. However, when a touch is detected, the device will enter the Fast mode again, allowing the detection integration to detect a valid touch event. The device will work in Low Power mode if the PWM pin stays permanently at LOW logic level. - SYNC mode is used to control the measurement bursts timing by the clock signal provided on the PWM pin. It is used to reduce crosstalk when using more devices, or to enhance noise immunity from low-frequency sources, such as 50Hz or 60Hz mains signals. The output of the device is routed to the INT pin of the mikroBUS™. The output pin is active high - on a valid detection it will be set to a HIGH logic level. The output will stay at the HIGH level as long as the touch event is active (touch hold) and will be terminated by the Max On duration feature - a timer that is set to about 60 seconds. If the event is terminated by the Max On duration feature, the device will be recalibrated. The Max On duration feature is normally used to resolve issues when the button detects an event for too long. If an object obstructs the sensor pad - e.g. when a protective plastic layer is added, this feature will recalibrate the sensor so it accommodates for this plastic layer. After every power on cycle, the device will recalibrate itself. It will take some time, so it should be taken into a consideration when building custom applications. MikroElektronika provides libraries and the demo application, that can be used as a reference for any future designs. The output of this device is too weak to drive a LED. Yet, a touch button is not good without the LED or other indication of its state. In order to drive a LED, Cap Touch click is equipped with the N-type MOSFET transistor, which is activated by the output pin of the AT42QT1010 IC. It can drive one red LED without a problem. The onboard SMD jumper labeled as VCC SEL is used to select the operating voltage of the device. It is capable of working with both 3.3V and 5V capable MCUs. Besides PWM pin, used for mode selection and the INT pin, used to signal the button state to the MCU, no other lines of the mikroBUS™ are used. Applications It can be used for touch activated lighting controls, touch activated control panels, toys and any other applications that need a switch or a button. Key Features Patented QTouch® sensing technology allows for low power consumption, auto calibrating and detection integration algorithms which improve touch sensing quality, Max ON duration for improved obstacle problem handling.